The best sliding miter saws can make your home improvement, woodworking, and professional construction jobs go smoothly and quickly! Each of the saws we reviewed has features to make sure your miter and angled cuts are clean, accurate, and easy to do safely. You can tackle flooring, molding, and other home improvement projects like a pro! Before investing in a new sliding miter saw for your home or workshop, here are some of those features you should know about first! Miter Range: The miter range is the angle range of cuts you can make on either side of your sliding miter saw. This allows you to make the perfect miter cuts for molding and flooring – even if your home’s corners aren’t perfect! Blade Size: Whether you want to tackle large or small jobs, we found a variety of saw sizes to fit your needs! The blade size affects the size and thickness of wood, tile, and other materials your saw can handle cutting through. Power: We’ll also tell you how powerful the motor is, so you can get the best one for you! Less powerful motors are fine for wood, while more powerful motors may be better for harder materials like tile or metal piping. Laser Guide: Some of the saws we reviewed come with a laser guide to help you get an accurate cut every time. They allow you to see where the blade is going, so you can line it up perfectly with your measurements! Weight: There are lightweight saws on our list for those of you who want a convenient tool you can move around easily. There are also heavy-duty saws that stay firmly in place, even when you are cutting heavy and cumbersome materials! Warranty: Investing in the best tools for your home and professional jobs means they’ll last for years. However, if something bad happens, a solid warranty will get you a replacement or repairs done so you can get back to work quickly! Now that you know more about what features your new sliding miter saw offers, let’s find the best sliding miter saw for you! We did the hard work for you and found 10 of the best out there to suit a variety of needs, from home improvement beginners to professional carpenters – and everything in between! If you’re short on time, that’s fine – just start by checking out the Top Pick and Budget Pick, and come back to read the rest! We begin our dual bevel sliding miter saw reviews with our Top Pick from Festool. This saw topped our list because it has features that make this saw easy to use! The rail forward design helps to improve the accuracy of your cuts, and it allows you to use the saw up against a wall, which is great for small spaces. The dual laser sights allow you to see exactly where you’re cutting for even more accuracy and control. It also has the ability to do a lot more than miter cuts! You can use this saw to make angled cuts with the easy to use dial adjustments, make straight cuts, and even use the trenching function to make notches for tricky spaces or lap joints! We also like that it comes with a dust collection port, so you can hook it up to a dust collector or heavy duty vacuum for easy cleanup and healthier air while you work! This compound miter saw from Hitachi is our Budget Pick for the best sliding miter saw for the money! 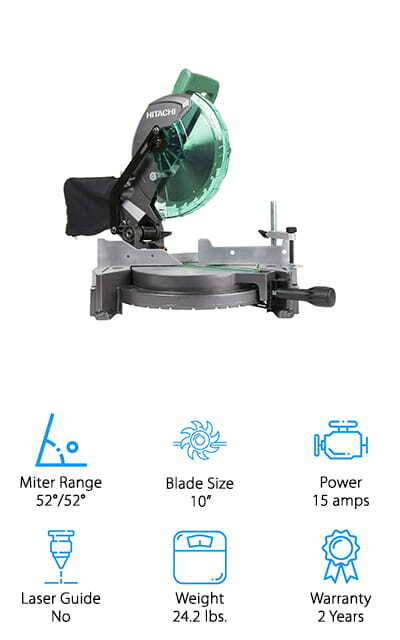 We like this saw because it has everything you need to make accurate miter cuts without any of the extra bells and whistles that make other saws more expensive. It can handle 52-degree cuts on both sides, and the angle is easy to adjust with just your thumb. 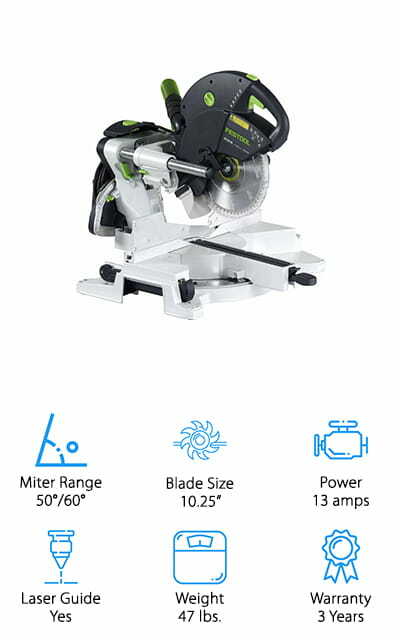 Even though it’s a small saw, it has a large enough table to keep even large pieces of wood stable while cutting for better accuracy and fewer slip-ups! We also like that this saw has a dust port, so you can hook it up to a dust collector for easy cleanup on the job. Oh, and it’s only about 24 pounds, so it’s lightweight enough to easily move around while you work! This is the best budget sliding miter saw for those of you who want performance and accuracy without breaking the bank! 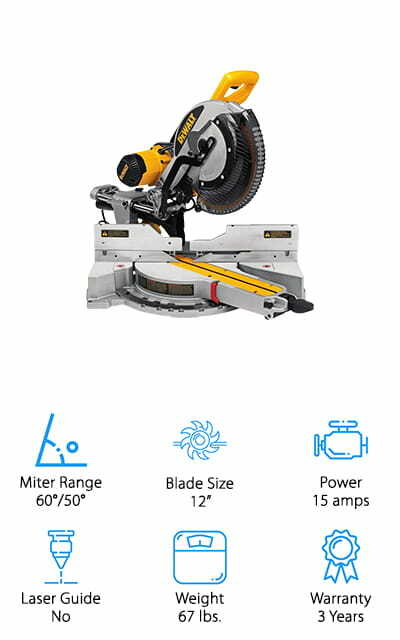 We scoured several 12-inch sliding miter saw reviews to find a larger saw that both home improvement fans and professional carpenters would enjoy using and found this great 12-inch option from DEWALT! If you’re looking for a heavy duty saw that handles tough jobs, this is a great choice! We like that it’s built for durability, thanks to the metal housing and large table. It also allows you to cut 2x16 lumber at 90 degrees and 2x12 lumber at 45 degrees, which is great for both home and professional jobs. The angle of your miter cuts is easy to adjust, and the clamp mechanism keeps everything in place for better accuracy. We also like that it comes with a large dust collection port, so you can reduce the mess and keep the air you breathe healthy and clean. If you’re looking for the best 12-inch sliding miter saw for home or work, this is a great option for both! 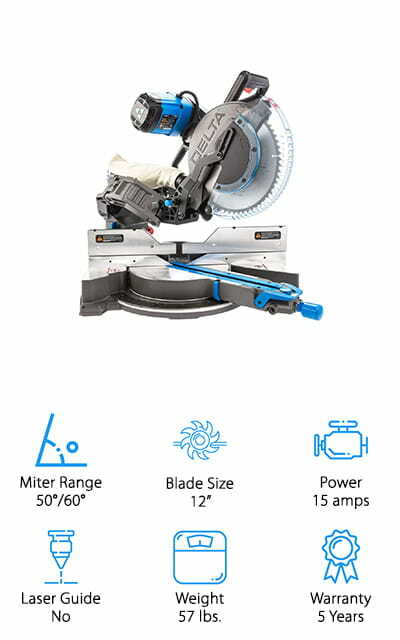 Another great 12-inch miter saw option comes to us from the brand Delta. Their Cruzer miter saw is made to handle tough jobs, works well in awkward spaces, and is incredibly easy to use! The large, heavy table allows you to make up to 18-inch crosscuts and a variety of angled or miter cuts in even thick or heavy wood with ease. We like that this saw is designed to be used up against the wall or out in the open, making it perfect for using in small workshops or awkward spaces. It’s also easy to use! This saw uses military-grade aluminum and heavy-duty bearings for a fluid, smooth cut every time – and you can even adjust the tension for more control and comfort! The angles are all easy to set quickly from the front of the saw, saving you time and keeping your cuts accurate as you slice through up to 7.5-inch molding, thick wood flooring, and more! When looking for the best cheap sliding miter saw, we also found this inexpensive saw that has everything you need to tackle your next big home project! We like that this saw can be easily adjusted to the height and angle you need to make accurate cuts into a variety of materials. It also has a laser guide, making it one of the most accurate sliding miter saw options for the money. We also like that this saw has a large base, adjustable clamp feature, and extendable platform to keep even large pieces of wood secure while you cut. This saw comes with a tungsten carbide tipped blade that cuts through a variety of materials easily, or swap it out for your own 12-inch blades to cut through metal, plastic, piping, and more! It also comes with a large dust port and small dust bag you can attach to the back of the saw to collect sawdust while you work! 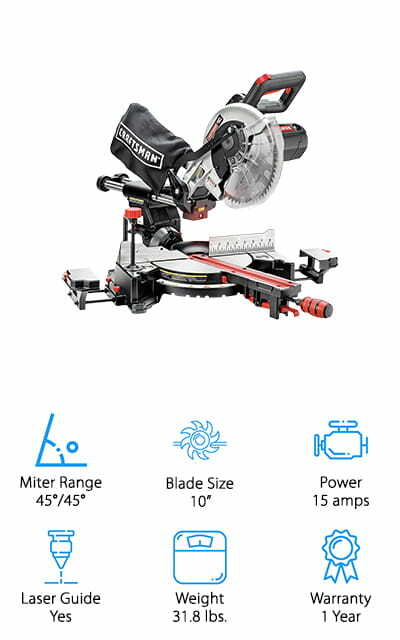 If you’re looking for a smaller saw that can handle just as much as the larger models we reviewed, this 10-inch miter saw from Craftsman has what you’re looking for! You can cut boards up to 12 inches wide, 3.5 inches thick, and 11.75 inches long with this compact saw. The laser guide helps you see exactly where you’re cutting, so you can follow your measurements and guides easily. 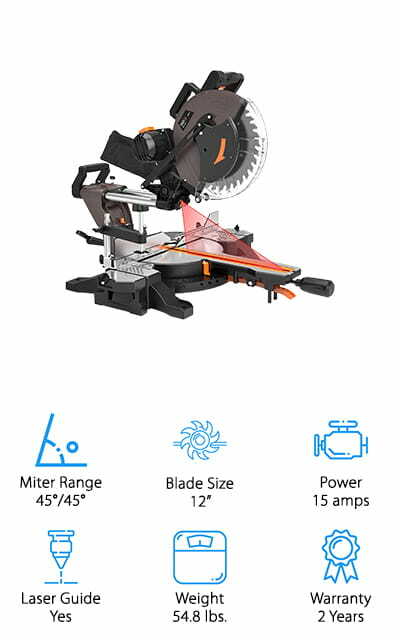 We also like that this saw only weighs 31.8 pounds, so you’ll have no problem moving it around your home, job site, or workshop! You can use the carbide tipped blade that comes with it, or swap in specialty blades to tackle plastic, metal sheets, or piping projects too! It also has a dust port with dust bag, keeping messes manageable and the air you breathe clean and safe. We think this is the best double bevel sliding miter saw to tackle all your woodworking projects without taking up extra space! If you’re wondering, “How do I choose the best sliding mitering saw without spending a lot of money?” then grab one of these 12-inch sliding miter saws from DOIT! We like this saw because it packs all the cutting power you need without costing a fortune! The 15-amp motor runs up to 3800 rpm, which is plenty of power to cut through soft and hardwoods with ease. This inexpensive saw is also easy to adjust, thanks to a miter locking knob you use with one hand, and a triggered handle you use to control the blade with the other. You can quickly make adjustments without needing to worry about knobs and dials! The laser guide also helps you make the right cuts each time. To keep your workspace clean, it also has a dust collection bag that keeps everything contained while you saw away! We think this would make a great gift for a home improvement or woodworking enthusiast! When looking for the best 8 1/2 sliding miter saw, we wanted to find options that were compact and lightweight, but don’t sacrifice on performance. 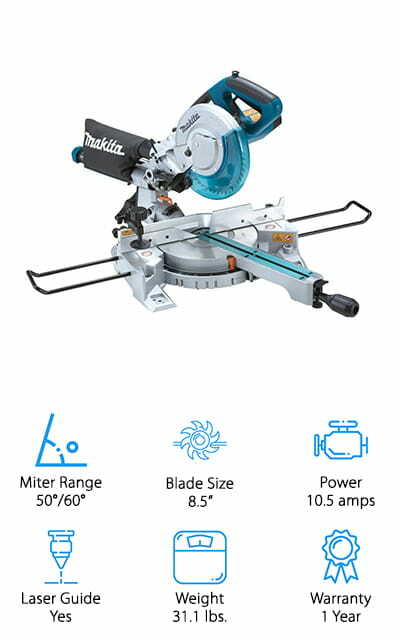 This compact saw from Makita is a professional-grade sliding miter saw that homeowners and carpenters will like for its versatility and convenience. 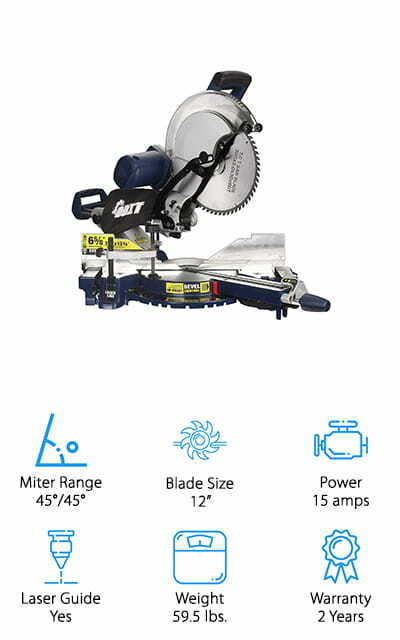 We like this saw because it’s easy to use on the job site or around the house. At only 31.1 pounds, you can carry it from room to room to cut wood flooring, molding, studs, and more! The soft start motor fires up consistently, and doesn’t require a belt to run – so no worries about replacing a broken or squealing belt! It creates smooth, accurate cuts on wood up to 12 inches wide with a miter range of 50-60 degrees per side. There’s also a laser guide to help get accurate cuts that follow your measurements and markings precisely. This is a great saw that gets the job done at home and work! Next up in our search for the best dual bevel sliding miter saw is this professional quality miter saw from Bosch! This brand is well known for making amazing quality power tools for professional construction workers, woodworking enthusiasts, and ambitious homeowners alike. If you’re looking to upgrade to a powerful, yet compact saw for accurate, clean cuts every time, this is the saw to get! You can use this to cut large pieces of wood, thanks to the expandable base extensions that allow for up to 29 inches of extra workspace. Miter and bevel cuts are incredibly easy to create, and the clear blade guard makes sure you can clearly see exactly where you’re cutting. We also like how easy it is to carry this saw around from the convenient top handle – and at only 37 pounds, you can easily move it where you need it! 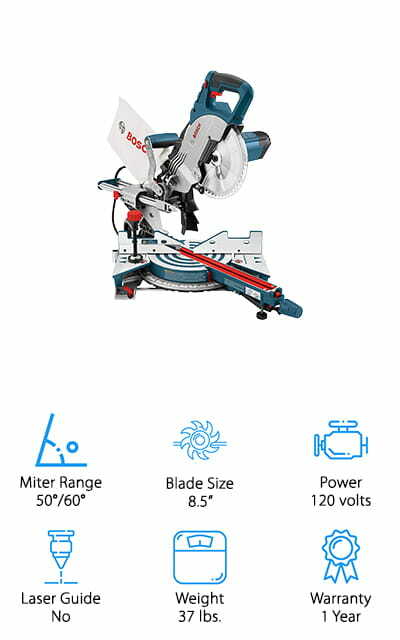 This is a high-quality miter saw that you will enjoy using for years! Last up in our hunt for the best rated sliding miter saw is this powerful and easy to use saw from the brand WEN! 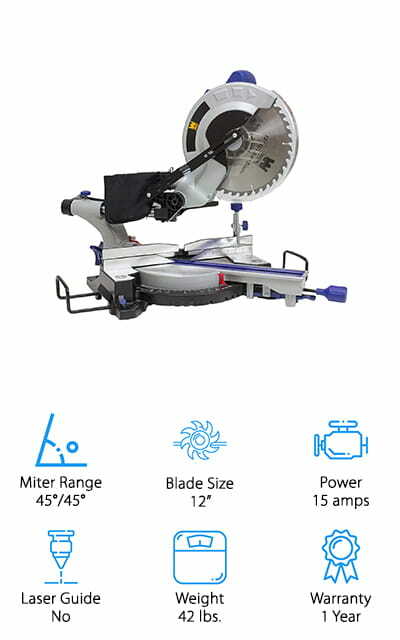 You can use this sliding miter saw to tackle a wide variety of home and professional woodworking projects, from installing your own wood flooring and molding to building your kids a new tree house in the backyard! This saw cuts wood up to 3.5 inches thick and 11.75 inches long, plus it can get you accurate bevel and miter cuts for professional-looking results! It’s easy to slide the blade to where you need it or make angle adjustments quickly, and there are 9 table stops on both sides for the most common angled cuts. We like that this saw also has extendable extensions that give you up to 32 inches of extra support for heavy and large boards. The dust bag keeps cleanup a breeze, and it is lightweight enough to carry from room to room!